Although my hair is pretty long now, the longest its ever been infact, hair extensions will always be a vital part of my 'going out' hair routine. I don't particuarly need them for length anymore but I love them for adding a bit of oomph and volume to my hair when I go out. I also find extensions hold a curl much better than my natural hair too which is great for someone like me who wears their hair curled 90% of the time. The colour choice on the Bobby Glam website isn't huge but theres enough shades to cover most hair colours. They don't see any bright or dip-dyed styles but they do have a nice selection of both block and highlighted colours. The one thing I always struggle with when buying extensions is finding a colour to match my highlighted blonde hair so to see they had a few varieties was nice. 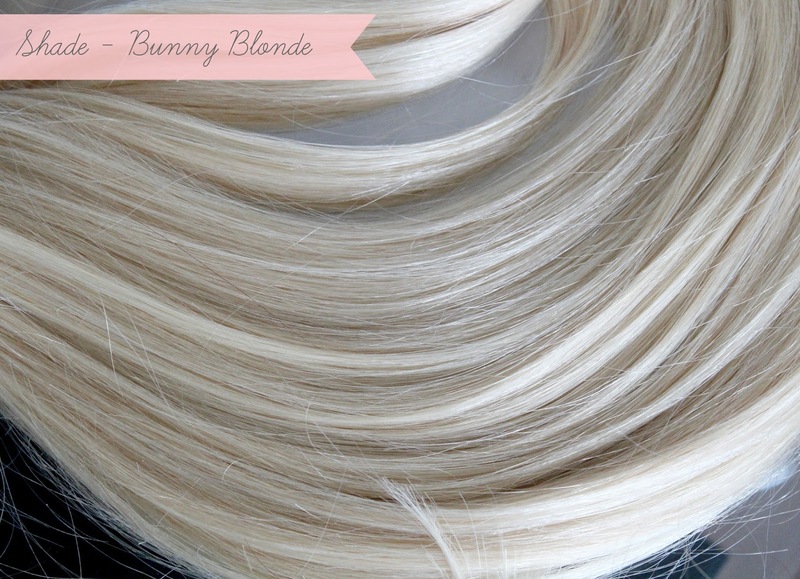 I decided on the shade 'Bunny Blone' which is the lightest blonde they offer but unlike some blonde extensions, they don't look yellow and unnatural. They seem to have golden and ash tones running through them as well as the bleach blonde which is great as they match my hair perfectly. There's two lengths available in 16-18" or 20-22" which again doesn't seem like a great deal of choice but I think this range of lengths will cover most hair types and there's always the option of cutting them shorter if needs be. As my hair is relatively long naturally, I decided to go for the 20-22" set and they're the perfect length for me being just a touch longer than my own hair. There's a few different sets of extensions available from Bobby Glam including double, triple and quad sets, all of which vary in thickness. I really like that there's multiple options as everyone's hair is different and therefore needs different amounts of hair to create a natural look. 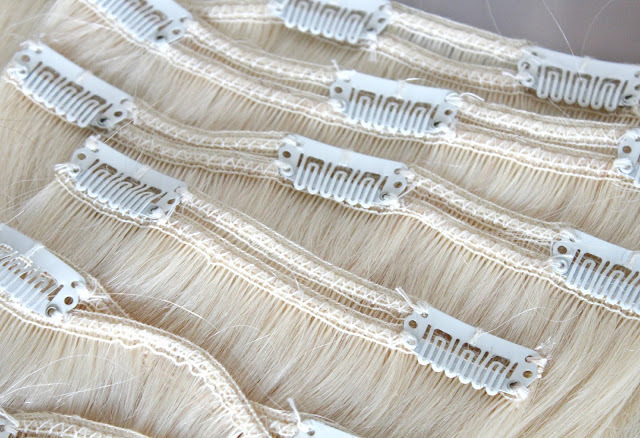 I received the double weft set which means instead of having one stip of hair per weft like most full-head sets of extensions, these ones have two strips sewn together for extra thickness. The set comes with 7 strips which you can see in my photos above and 140g of hair which is quite a lot considering extensions I've used in the past have had no more than 100g. I have naturally thick so this is perfect for someone like me who needs that extra thickness without needing to add two times the amount of wefts. The thing I love most about these extensions is how thick they are from top to bottom. 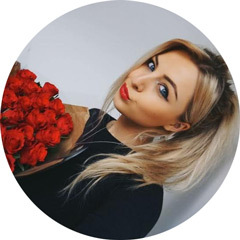 If you've tried a lot of hair extensions like me, one thing you might of noticed is how they always tend to be a lot thinner towards the ends. This bugs me no end as the last thing I want is for my hair to look thin at the ends as the reason I'm buying extensions is to add thickness. 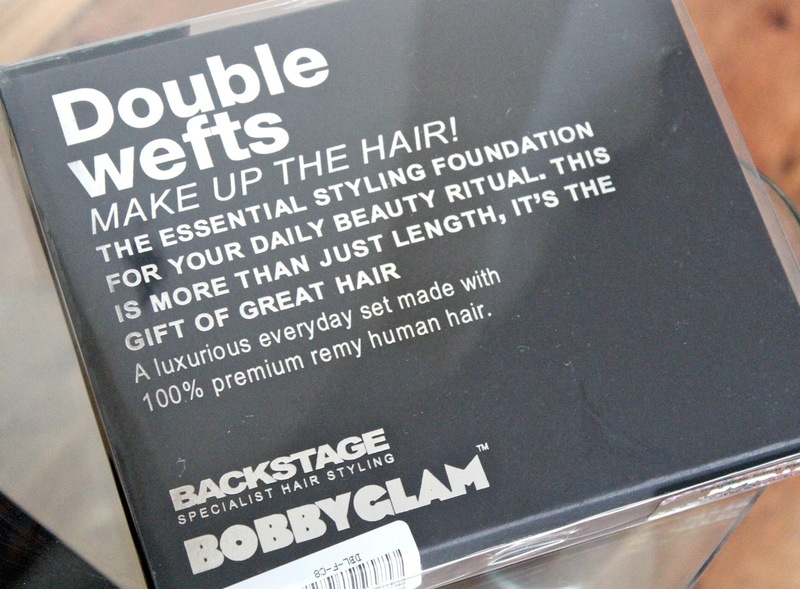 With this Bobby Glam extensions, they're the same thickness from top to bottom with no scraggly thin ends in site. This is a major plus point for me and like I said, not something I've found in other extensions. The clips are really good quality too and once I've secured them into my hair, they don't budge all night. The Bobby Glam extensions are made with 100% human remy hair which means they're safe to be styled with heated appliances. As I said earilier, I always wear my hair curled on a night out which means my extensions can often get abused with hair straighteners. However, I've been wearing these extensions on nights out for the past couple of months now and the quality has really held up so I'm very impressed. They're just as sleek and shiny as the first time I wore them and they curl like a dream. I don't find they pull of tug on my straighteners and instead glide through them to create a perfect bouncy curl. I've even sprayed them with loads of hairspray and worn them at a festival and they're still as good as new. If the past two months are anything to go by, these extensions should last me a long time. Yay! Overall I love these extensions and I'm going to go as far as saying they're the best ones I've ever used, purely down to the fact they're the same thickness from top to bottom which is something you don't often find in hair extensions. I also love how silky soft they are and although I've worn them on numerous occassions now, the quality has remained. If you're looking for some new extensions, I can't recommend these ones enough. The double-weft set I've got are currently reduced from £84.99 to £64.99 here so its the perfect time to treat yourself if you're on the hunt for a new set! 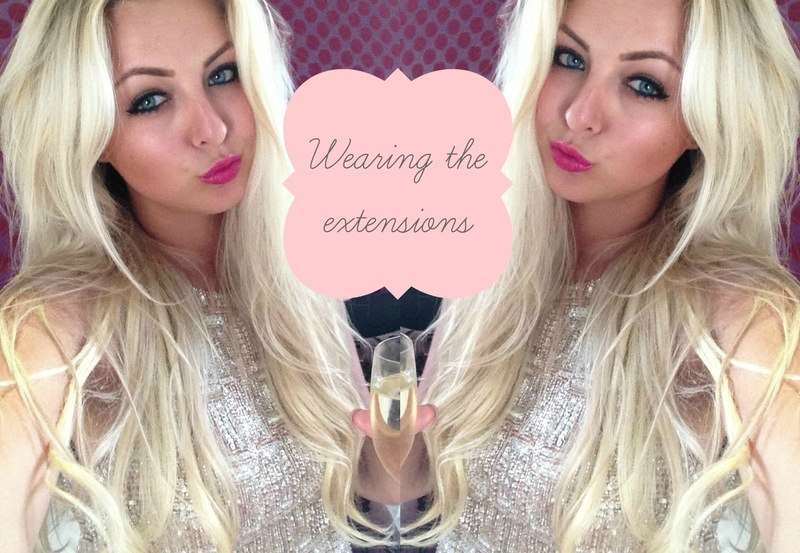 Are you a fan of hair extensions? Have you tried Bobby Glam? I love these extensions they look fab on you, I have the triple wefted set and they are amazing! Such great quality! I wear Hedkandy/Dirty Looks and these look like a great alternative. 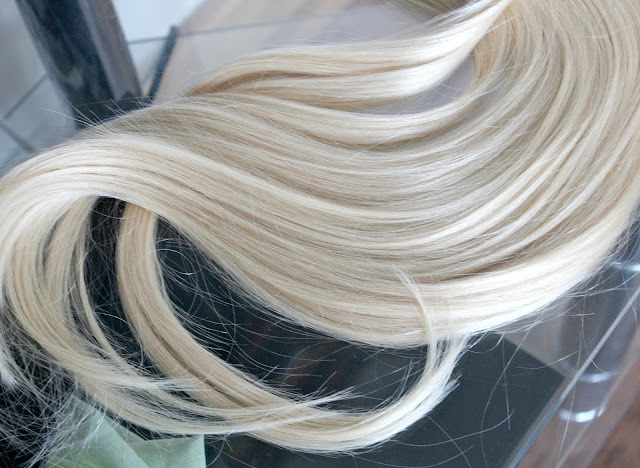 Its good to see decent blonde extensions, and ones that are similar to my colour, as some do give extensions bad names! I will be looking out for these when I replace mine for sure! These look really good on you! I have never tried extensions, but now my hair is slightly longer these may be worth a look! Extensions look lovely in, they seem really good quality and look to have a great thickness to them! Another thing for my wish list! Wow! These looks so natural. They look fabulous. I haven't had any experience with extensions as I have REALLY long hair, but when I got married last year one of my bridesmaids wanted extenstions as she was the only one out of us with short hair (my other bridesmaid has long hair too, and we went for a "hair down" look). I got hers from Halo and although not cheap, they were really good. They looked great on the day but she told me that they don't hold curl at all. I think I might have to point her in the direction of these for sure, they look stunning. I have to admit, I am quite tempted to get some just to thicken my hair out! Aw Kayleigh, your hair look so lovely and swishy and is making me super jealous right now! Also, how gorgeous do you look in that photo Mrs? Can I just be you please? Thank youuuuuu! 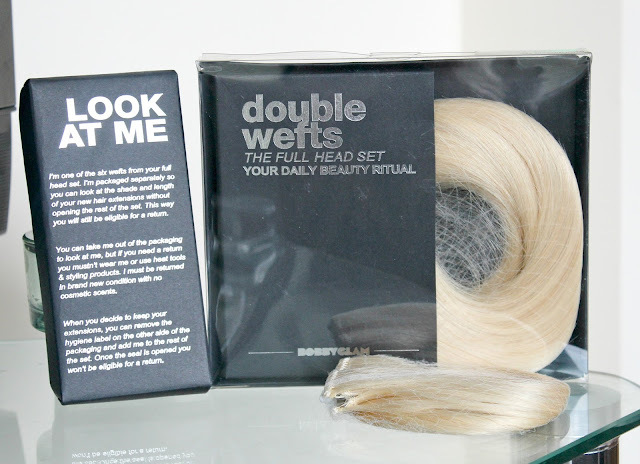 I've been wearing hair extensions for several year, I buy Double Wefted Remy but I never pay more than 30£ for them! Cannot believe they charge 65£! Ahh makes me want to buy hair extensions again.. but I really don't like clip ins as I feel them all the time cause I've really thick hair.. I need loads of clip ins which is really heavy. Do you know a good website which sells microring extensions in a dark reddish colour? Great post and the pictures show so much detail, it´s like you hold them in your own hands! Love it! These double weft hair extensions are looking very beautiful.Thanks for this valuable information. The product is really very nice.Thanks for this beautiful post.keep sharing. amazing post! 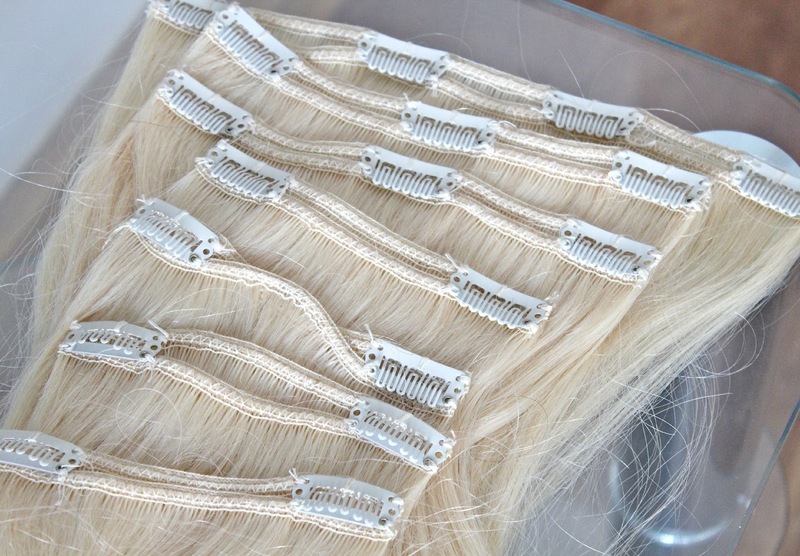 These double weft hair extensions are looking very beautiful.The product is really very nice.thanks!